I think we’ve all had those days when nothing seems to be going right. When the fates seem against you. When, no matter how you try, you can’t seem to catch a break. When the gods don’t seem to be listening. I’ve certainly had my share, and today was one of those days. I was on my walk along the bay with the sun shining brightly in from my left. I felt a few sprinkles of rain, nothing worth trying to duck and cover. As the stray drops landed on my face I thought, with the sun shining so brightly, there must be a rainbow. Turning to my right, there it was. The first one I’d seen in a very long time. Alternating between a full and half arc, it glowed in the sky like a beacon of hope. That sight immediately brightened my day and my outlook. How can that be, when nothing had changed? There were no pots of gold lying about. No knight in shining armor came riding his white steed down the road to whisk me away to his castle. My situation and all the things I had been fretting over hadn’t changed. Yet, there had been an alteration. The change took place in my heart and in my soul. My spirit was instantly lifted. I even saw a second one on my way back – equally as beautiful and equally as magical. There is something awe inspiring in the appearance of such an amazing display out of nothing more than a few raindrops and some sunlight. It made me think about those proverbial pots of gold. They aren’t always the literal variety. We probably don’t always recognize them when they do appear because they take on such everyday appearances – a return to health, a letter from a friend or loved one, a job or promotion, getting published, surviving a car or plane crash, getting a recording contract, passing the driving test, finishing that college degree, all those things, some big, some small that give us a lift, like the sight of a rainbow. 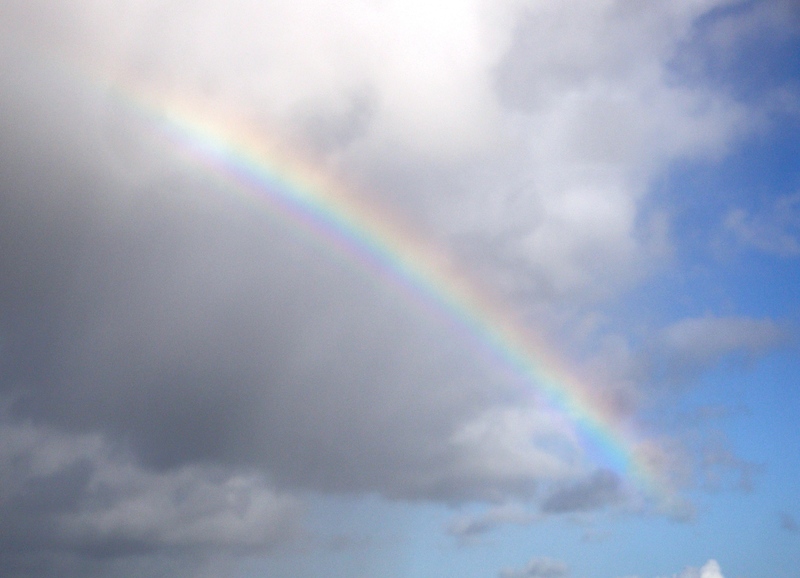 I hope that all who read this are able to find their own rainbow the next time they are in need of one. I’ve come back to this post several times – it really speaks to me… maybe because with everything going on I could use a reminder to look up and seek my rainbows. Thanks! I’m glad you enjoyed it. It’s amazing what some of the simple things can do to lift the spirits.